We have been reporting about a third device from Huawei in addition to Mate 20 and Mate 20 Pro in works for some time and today we have the official confirmation of the name of the device i.e. Huawei Mate 20X. Earlier rumours did point to the same name of Mate 20X though often we thought that the company may name it as Mate 20 Max. The confirmation comes from the official twitter handle of Huawei which released a video teaser for the device and confirmed the launch of the same on October 16. 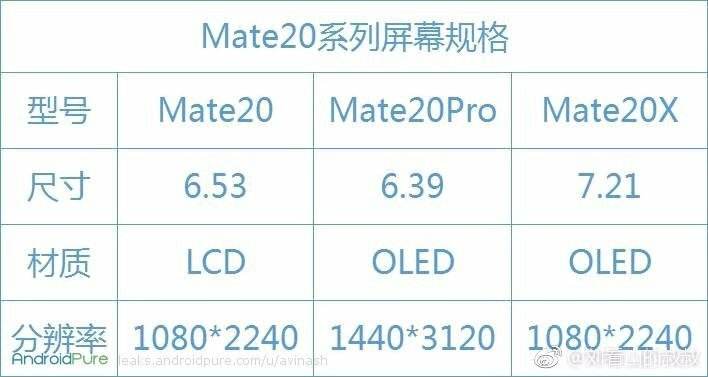 Check out the leaked image below that we reported sometime back which revealed the display details of all the three variants of Mate 20 series including the resolution and size. Rumours indicate that Huawei Mate 20 features a 6.53-inch TFT LCD FHD+ display with a screen resolution of 2244 x 1080 pixels with a water-drop notch display. It is powered by an octa-core Kirin 980 processor and has a fingerprint scanner on the rear. It is backed by a 4,000 mAh battery. Whereas Huawei Mate 20 Pro is rumoured to feature 6.39-inch TFT OLED QHD+ display which has a screen resolution of 3120 x 1440 pixels, and a usual wide notch display design. It is powered by an octa-core Kirin 980 processor and comes with an In-display fingerprint sensor. At the moment not much is known about the hardware specifications of Huawei Mate 20X. Stay tuned at Androidpure and we will keep you updated.